LLOG Exploration today provided an update on the status of Deepwater drilling contracts, production at the Who Dat field, development activities at the Marmalard discovery, and its recent Powerball discovery. On April 2, a three-year contract, with an option for an additional year at mutually-agreeable rates, between LLOG Bluewater Holdings, LLC (the joint venture partnership between LLOG and Blackstone) and Sevan Drilling was announced for the Sevan Louisiana ultra-deepwater drilling rig that is currently under construction in China. The rig will be capable of drilling in water depths up to 10,000 feet, and is scheduled for delivery in Q4 2013. On April 16, LLOG Bluewater Holdings and Seadrill announced a three-year contract, with an option for a fourth year at mutually-agreeable rates, for the new-build, ultra-deepwater drillship West Neptune. The West Neptune is being built in South Korea and is scheduled for delivery in Q2 2014. The rig will have two BOPs, will be outfitted to work in up to 10,000 feet of water, and is capable of water depths up to 12,000 feet and drilling depths up to 37,000 feet. First production from the fifth well in the Who Dat field at Mississippi Canyon 503/504/546/547 was initiated on April 12, bringing total production to 28 thousand barrels of oil and 58 million cubic feet of gas per day. The development plan for the field calls for the company to drill eight additional wells, which would fully utilize the 60 MBOPD and 150 MMCFD capacity of the floating production system. Drilling activities are underway on Mississippi Canyon 255 #1, a development well resulting from the Marmalard discovery announced in August of 2012. The Marmalard discovery well at Mississippi Canyon 300 was drilled to a total depth of 18,100 feet and encountered two oil-bearing zones. Marmalard is one of the discoveries that will be tied back to the Delta House Floating Production System, which is under construction and scheduled to begin operations in 2015. LLOG Bluewater owns a 26% working interest in Marmalard. On the Shelf, the South Timbalier 231 #1 well (Powerball South) was drilled to a depth of 18,915 feet and encountered over 90 feet of net gas/condensate pay in high quality reservoir sands. Facilities are being constructed to bring the well on line in Q3 2014, and another well is planned for later in the year. LLOG Bluewater owns a 74% working interest in South Timbalier 231/232. Two days later the Fed announced Ben Bernanke would not attend the Jackson Hole summit, for the first time in twenty five years. A couple days after that the New York Times (on the first page, no less) ran an in depth profile of Janet Yellen, the heir apparent to run the Fed. Beneath her profile there were three other candidates “being discussed:” Roger Ferguson, Tim Geithner and Larry Summers. We normally do not spend time handicapping presidential appointments. In this case; however, we think the choice for next Fed Chair may have profound economic implications, and that it would not require expertise in econometric modeling, credit policy management, and maintaining the public perception of economic stability. As we wrote last week, we think the next Fed Chairman will oversee a conversion of the global monetary regime. A thick skin, diplomatic skills, and strong relationships with global banks and monetary policy makers will be the skill set most needed. We think Tim Geithner (with Bill Dudley as an alternative) will take over the Fed when Ben Bernanke steps down next January, and it seems by all indications that the table is already being set. We attended a small dinner party a few years ago at which an iconic financier (and major Obama supporter) let it slip that he questioned one of Obama’s most senior aides just prior to the 2008 Democratic convention about taking over the economy when it was imploding. The aide waived it off and exclaimed; “oh don’t worry, Bobby has it covered!” Most of the table was relieved that Bob Rubin still had their backs and that banks would keep priority. Such was, and remains, US economic policy. Neither growth nor austerity nor gloom of night will stay these currencies from their appointed devaluations. Bank balance sheets must be preserved; ergo sufficient inflation must be manufactured. We think the dull but persistent economic malaise amid increasingly aggressive monetary intervention policies will soon engender fear among the not-so-great washed – net savers. This happier band of brothers cannot maintain an edge when the real economy contracts and interest rates are already at zero. Base money is already being manufactured in the form of bank reserves and the total money stock is not growing because there is very little natural economic incentive among the rest of us to consume (much) or take risk. Something and someone new is needed. Ben Bernanke seems like a brilliant political economist and a decent guy, the top of his field in terms of comportment, academic credentials and specific competence in understanding historical monetary policies during a counter-cyclical (i.e., de-leveraging) period. Perhaps Janet Yellen is too? But such qualities are not what we think will be preferred by the powers that be now that global resource producers are openly questioning US, British, Euro and Japanese monetary policies and reserve holders are realizing their stash is being methodically turned to trash. Meanwhile, aggregate leverage is growing and real economies are withering. Does anyone believe that Ben or any other monetary authority has been proactive, or that any fiscal authority has enacted legislation that promises to help achieve “escape velocity?” Can’t we all agree that the rationale for economic policy may be boiled down to the counterfactual: “yes, but imagine if they withdrew liquidity or enforced true austerity – it would be worse!”? Is there a serious analyst who still believes economies can grow their ways out of being over-levered without leveraging further? Whether or not contraction has to come-a-knocking prior to a monetary reset is anyone’s guess, but it would be difficult to imagine monetary system change without a generally-recognized economic tragedy that precedes it. This implies disappointing GDP prints, declining corporate revenues and maybe even a swoon in stock and real estate markets. We have already begun to experience the first two. Now that we read global central banks have begun buying equities, perhaps equity prices may be controlled too (as are the level of interest rates via large scale asset purchases like QE and relative currency exchange rates via timed interventions)? Negative output growth and asset price busts would certainly open the door for our hero to enter. The role of a central banker in the late stages of de-leveraging seems to be volume triage, as they say in intelligence circles – reacting to an increasing barrage of events as they occur, wherever they may occur. In economics as in policing, the bad guys always get to take the first shot. From the central banker’s perspective, the bad guy in the current regime is the real economy. If it continues to shrink, as we think it must, then TPTB must change the way they do business. We think the box we drew in Imperial Constraint is the key metric in understanding the forces behind economic growth and market pricing. An inflationary leveraging perpetuates imbalances while deflationary deleveraging threatens the survival of the banking system at large. Hopes for organic credit growth, which would promote the former, are now fleeting. This, in turn, engenders the threat of the latter. 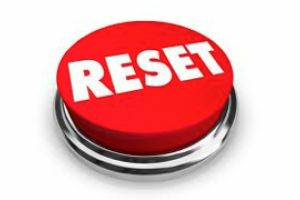 Continued ZIRP, increasing asset purchases and a steep decline in the universal efficacy of it all suggests the time to press the reset button is quickly approaching. May to December 2013 may turn out to be the darkness before the dawn; a time we look back upon and choose to forget. All in all we think the most efficient Fed Chair in advance of a reset would be Paul Krugman. He seems willing to destroy the current global monetary system with swift dispatch, without consultation, declaration (or second drafts). Alas, capitalist economies in liberal democracies require level-headed responses to market forces. There is no place for rogue pro-actionists. Institutions like the Fed are meant to appear as first responders working on behalf of the societies their banks serve. And so we think that circa 2070, our children will write and read (140-word) biographies about how Timothy Geithner saved the world from economic darkness. Geithner will save the day and bring glory to the Obama presidency by reducing the burden of debt repayment while maintaining the nominal integrity of debt covenants and bank balance sheets. The only way to accomplish this would be by destroying the currencies in which those debts are owed. Net debtors will rejoice and net savers (all 1% of them?) will suffer, finally realizing their unreserved currencies and levered financial assets were never sustainable wealth in the first place. Our little narrative could certainly turn out to be wrong, but we discuss it here (against all political wisdom) because we cannot find another one that better fits current macro and market pricing trends. If we are wrong about Mr. Geithner, we think it would imply that TPTB (raise your hand if you think the Fed’s shareholders do not choose/approve the Fed Chairman) believe a clear-headed and decent academic political economist can figure out what all past ones could not: how to support asset prices beyond ZIRP and central bank asset purchases. (Ben is gone, long reign Janet!) That is not our projection. When and if it becomes clear that Tim Geithner will ascend the steps at Eccles, we think it would already be too late to buy physical gold and resources. The only play remaining for financial asset investors looking to get full value after the reset would be shares in precious metal miners and natural resource producers holding reserves in nature’s vault. Properly held bullion and shares in precious metal miners would act as the most efficient store of purchasing power over the course of the devaluation and conversion. (Worst to first? Get ‘em while they’re cold!) Futures, ETFs, unallocated bullion holdings and other fractionally reserved claims on physical reserves easily replaced with cash would not participate. If our scenario comes to pass, then bank, government and consumer balance sheets would be quite healthy following the reset and would be ready to expand. We would think consumable commodities and shares in their producers would lead equity markets higher and that interest rates would remain low, as further inflation would be mitigated by the discipline of a full or partial peg to precious metals. 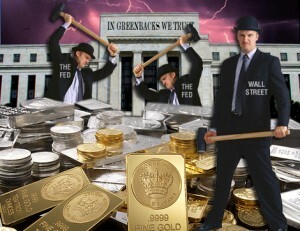 When gold prices hit $1,917.50 an ounce on August 23, 2011, a gain of more than $500 an ounce in less than eight months, capping a rise over a decade from $272 at the end of December 2000, the Federal Reserve panicked. With the United States dollar losing value so rapidly compared to the world standard for money, the Federal Reserve’s policy of printing $1T annually in order to support the impaired balance sheets of banks and to finance the federal deficit was placed in danger. Who could believe the dollar’s exchange rate in relation to other currencies when the dollar was collapsing in value in relation to gold and silver? The Fed is creating 1T new dollars per year, but the world is moving away from the use of the dollar for international payments and, thus, as reserve currency. The result is an increase in supply and a decrease in demand. This means a falling exchange value of the dollar, domestic inflation from rising import prices and a rising interest rate and collapsing bond, stock and real estate markets. Consider the 500 tons of paper gold sold on April 12. At the beginning gold price that day of about $1,550, that 500 tons comes to $24.8B. Who has that kind of money? Under President Obama, two women have been the director of the Environmental Protection Agency (EPA), Carol Browner, who served in the Clinton administration and was one of the “czars” Obama appointed; her acolyte Lisa Jackson, and up for the post is Gina McCarthy. Browner and Jackson went out of their way to conceal their internal communications from Congress and McCarthy lied to the committee considering her nomination. Apparently, the primary consideration for the job of EPA Director is an intense desire to destroy the use of hydrocarbons, oil, coal and natural gas, for transportation and all other forms of energy on which our economy depends. Obama, when campaigning in 2008, made it clear he wanted end the use of coal to generate electricity. At the time, fifty percent of all electricity was produced by coal and now that figure is in decline as coal-fired plants are being forced to close thanks to EPA regulations. If Ms. McCarthy has her way, the cost of driving cars and trucks will go up in the name of protecting the health of Americans. As Paul Driessen, a senior policy advisor for the Committee For a Constructive Tomorrow, recently noted, “Since 1970, America’s cars have eliminated 99% of pollutants that once came out of tailpipes.” Joel Schwartz, co-author of “Air Quality in America”, points out, “Today’s cars are essentially zero-emission vehicles, compared to 1970 models.” The EPA’s latest attack on drivers is the implementation of “Tier 3 rules” intended to reduce sulfur levels to achieve zero air quality or health benefits. Suffice to say that the air and water in America is clean, very clean. Whatever health hazards existed in the 1970s no longer exist. Like all bureaucracies, the EPA now exists to expand its budget and its control over our lives. The Heritage Foundation has calculated that Obama’s EPA’s twenty “major” regulations—those that cost $100 million or more annually—could cost the U.S. more than $36 billion per year. Obama’s EPA has generated 1,920 new regulations. Don’t think of the EPA as a government agency. It is a weapon of economic destruction. The other sector in the EPA’s bull’s eye is agriculture. Not content with laying siege to auto manufacturers, oil refineries, coal-fired plants, and all other energy users that might generate carbon dioxide and other so-called greenhouse gases, Barrasso noted that the EPA “has gathered personal information about tens of thousands of livestock farmers and the locations of their operations” which it then shared with environmental groups. The point of this exercise is demonstrate that the EPA is the very definition of a “rogue agency” for which neither laws, nor science, are of any consequence as it pursues policies that do incalculable harm at a time when the nation is deep in debt and in need of economic growth, not regulatory strangulation.